Fox Lake police suicide: Chicago-area officer Joseph Gliniewicz allegedly arranged own death as cover-up. 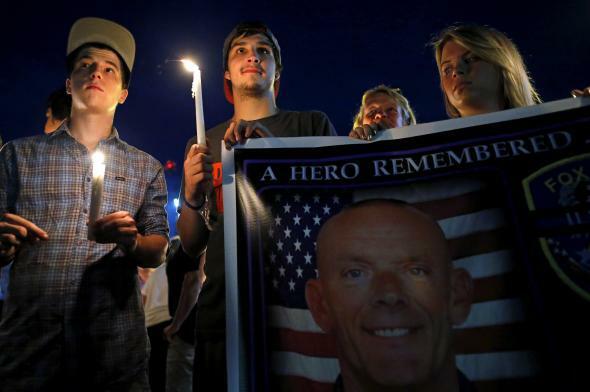 A candlelight vigil for Joseph Gliniewicz in Fox Lake, Illinois, on Sept. 2, 2015, when he was believed to have been shot in the line of duty. George Filenko, commander of the Lake County Major Crimes Task Force, called Gliniewicz’s actions the “ultimate betrayal” that included intentionally leaving a staged trail of police equipment at the crime scene in an attempt to mislead police to believe his death was a homicide. Filenko and other law enforcement officials announced details of the investigation’s findings that Gliniewicz took a large sum of money from Fox Lake Explorer Post 300. Thousands of dollars was used by Gliniewicz for personal purchases, including travel expenses, mortgage payments, gym memberships, adult websites, facilitating personal loans and unaccounted cash withdrawals, Filenko said. Stealing from a kids’ program to pay for adult websites! Police say Gliniewicz left the trail of items, including his baton and pepper spray, strewn near his body after calling in the report on suspects who don’t seem to have ever existed. The investigation into his death has implicated two other people in possible criminal activity, authorities said, but did not provide further details.